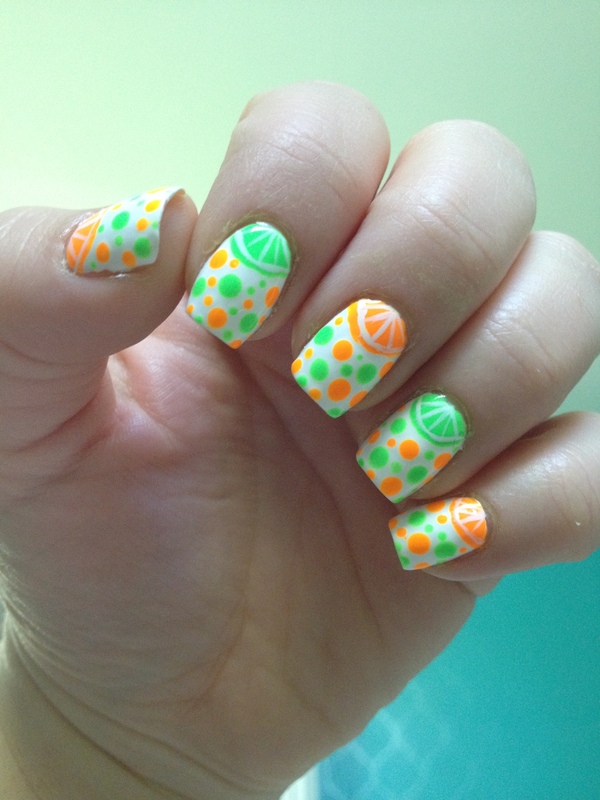 These neon citrus nails really have nothing to do with what I’m writing about. I’m just really happy with how they turned out! I’m super happy to have gained some new readers lately, and that made me realized that a review of the basics of nail care is in order. Here we go. 1. If your nails aren’t as long as you’d like them, keep some kind of nail strengthener on them to help them grow. Right now I’m using Rejuvicote. It’s about $10 and one bottle is lasting me forever. I’ve heard good things about OPI Nail Envy, and Sally Hansen has all sorts of nail care products that can help your nails grow. Just keeping polish on your nails adds an extra layer of strength to your nails. 2. Pick a shape for your nails. Right now I’m rocking “squoval”. I like how square nails look, but the corners of my nails feel sharp and scratchy, and that drives me nuts. Because of that, I file my nails straight across the top, and then round off the sharp edges just enough so that they don’t bother me. I don’t ever cut my nails. If they start to get a little too long for my liking, I just file them straight across with a glass nail file. A glass file, by the way, is not nearly as harsh on your nails. 3. For heaven’s sake, push back your cuticles. Pushing back your cuticles instantly makes your nails look longer and gives you a larger surface area to polish. You can buy fancy tools to do the job, but you don’t need them. I generally push mine back when I’m in the shower. After your cuticles are softened by the water, just take the thumbnail on your opposing hand and use it to gently push back your cuticles. 4. Moisturize. You can use cuticle oil for this, but any good, heavy hand lotion will do. I generally moisturize throughout the day, especially after I wash my hands, and at night before bed. The only time you don’t want to moisturize is right before you polish your nails. It will keep the polish from properly adhering to your nails and your polish will be chipping off in no time. As far as nail care goes, that’s all I can think of right now. I think I’ll follow this up with Nail Polishing Basics and Nail Art Basics…. I’ll call this my Basics series. Thanks for reading, commenting, subscribing and whatnot! 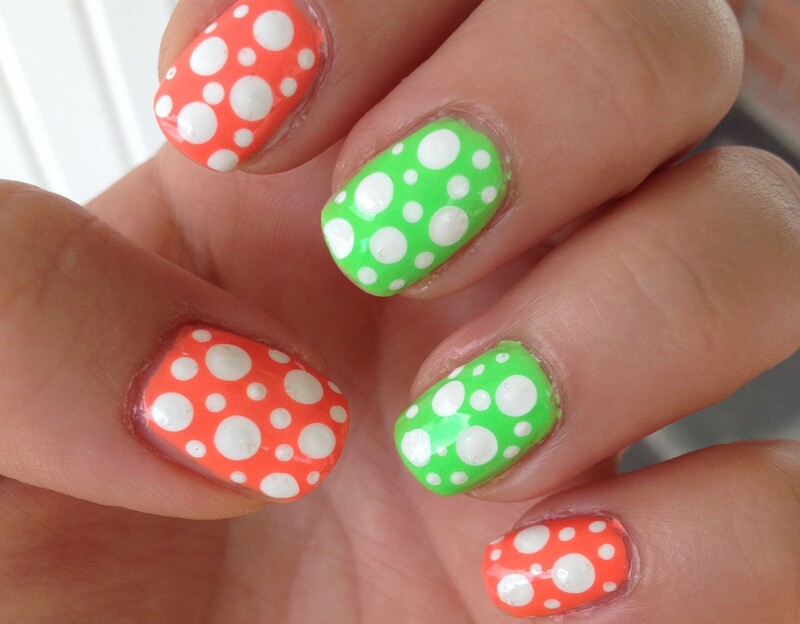 This entry was posted in Nail Care and tagged nail care. Bookmark the permalink. Good idea to push back your cuticles in the shower. I will try that. Cute design!